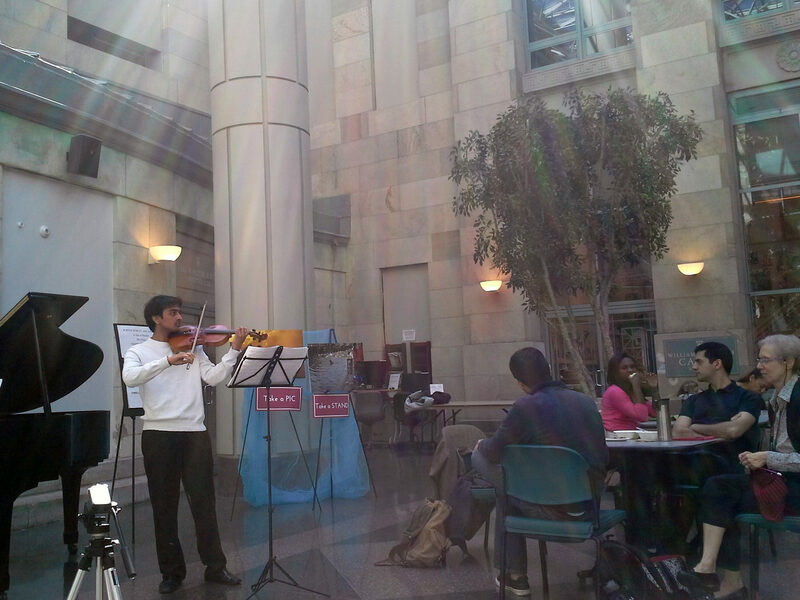 Ram Venkateswaran, of the HMS class of 2017, performs in the Tosteson Medical Education Center’s atrium last spring. He and pianist Chris Lim, HMS ’16, offered a joint program: “Sicilienne” (Fauré); “Sicilienne” (von Paradis); “Spanish Dance” (Granados/Kreisler); and “Widmung” (Schumann/Liszt). Clinical instructor in medicine Martha Ellen Katz with pianist Alvin Chen, HMS ’15, who also performed “Widmung,” as well as Chopin’s Andante Spianato and Grande Polonaise, op. 22. 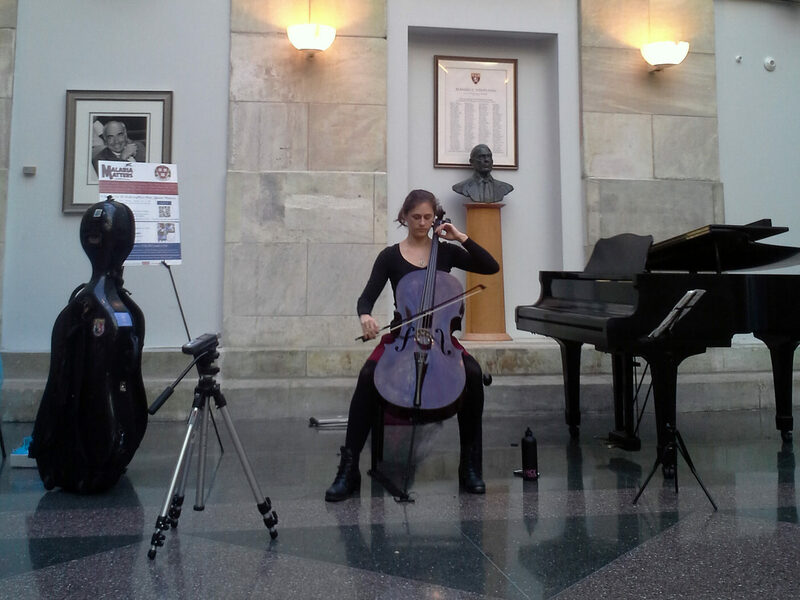 Mckenna Longacre, HMS ’17, performed selections from Bach’s First Cello Suite in G Major. Sunlight streams through the glass ceiling, glinting off the grand piano at one end of the atrium in the Tosteson Medical Education Center (TMEC). 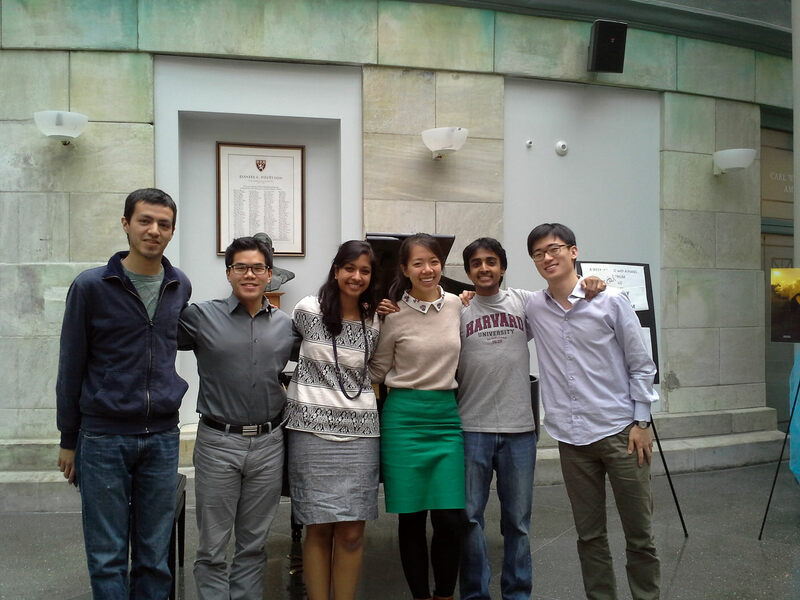 It’s lunchtime at Harvard Medical School (HMS). First- and second-year medical students are studying at the tables scattered throughout the atrium as fourth-year students, assured of their residencies, chat with each other, carefree. Ph.D. students take a break from their lab work to eat lunch. Faculty members rush through, en route to or from meetings. Then a woman walks in, seats herself at the piano, warms up with some scales and chromatics, and—without a break or announcement—begins her first recital piece, “Ondine,” from Ravel’s Gaspard de la nuit. Although many in the room continue with their agendas, others pause to listen—and almost everyone claps at the end of each piece. For a week this spring, the grand piano stood in the TMEC atrium. Performances occurred daily at lunchtime, twice in the early morning before classes, and over the weekend—the culmination of months of hard work by faculty members and medical and dental students, including members of the schools’ student council and the HMS Chamber Music Society. The piano and the week of recitals were one facet of a bigger movement joining medicine with the fine arts—quite literally—as the medical school seeks to integrate the humanities into its traditional curriculum, reflecting the University’s initiative on the arts launched by President Drew Faust in 2008. Two years ago, HMS faculty and students came together to advocate for the creation of the committee now known as Arts and Humanities @Harvard Medical School. But even before that notable development, proponents of integrating the arts into the curriculum ensured that all medical and dental students would participate during their first two years in small-group discussions that emphasize looking at patients as individuals, not just as fascinating or educational cases. First-years, for example, can take “The Healer’s Art,” a course directed by HMS dean of students Nancy Oriol that focuses specifically on the compassionate and humanistic side of medicine. Fourth-years can take an elective that includes visits to the Museum of Fine Arts, where students explore their ability to “see” the diagnosis by observing images of patients. More informally, students may choose to join the chamber-music group, participate in the traditional second-year show, or become a member of the school’s a cappella group, the Heartbeats. you never know what’s going to happen—because each piece and each performance is different, and each patient is different. Also, as it is a privilege to treat each patient, so too is it a privilege to play music for others. When we play for an audience, we see the effect it has on other people. You have that experience, too, when you talk with patients. And when you’re performing, you’re sharing such a large part of yourself—but hiding a lot as well. When we talk to patients, we have all had to learn to share emotions with our patients—but again, not too much. As the practice of medicine evolves, so, too, does the medical-school curriculum and the way in which medical and dental students become professionals. Novel efforts to foster that process will help create well-rounded, empathic future physicians. Integrating music within medicine is just a start within the University’s effort to interweave the arts with a traditional curriculum—but at HMS, a harmonious revolution appears to be under way. Updated August 2: Tania Rodriguez works in the Office of Human Resources, not in the Office of Communications and External Relations, as originally reported. Karolina Brook, M.D. ’14, a native of South Africa, enjoys writing about medicine and keeps a blog, “You won’t feel a thing.” She is currently completing her internship at Mount Auburn Hospital in Cambridge, and will begin an anesthesiology residency at Massachusetts General Hospital in 2015.